In almost all of the countries, regions, and traditions, only in the spiritual realm can the goddesses exist. 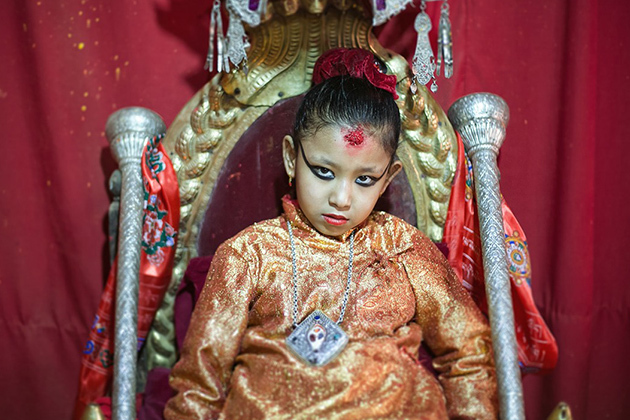 However, in Nepal, there are living goddesses. They truly live and breathe. 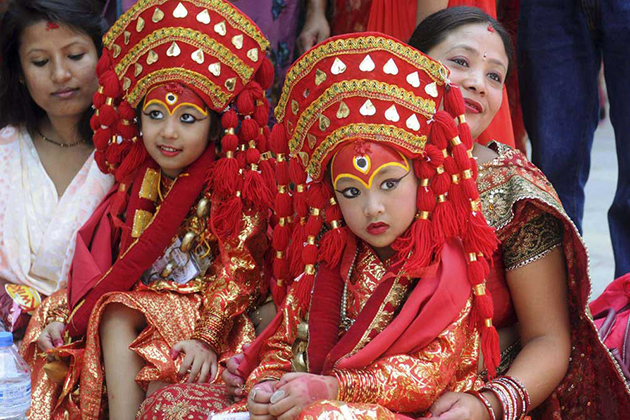 They are called Kumari (literally means virgin in Nepali), or “living goddesses, and they are the symbol of hope, manifestations of divine and spiritual energy. There are numerous tales around the legend of Kumari. However, there are two most common tales relating to the King and the Goddess Taleju, which are widespread, told and believed by people in Nepal. The first tale is about King Jaya Prakash Malla, who was the last king of the Malla Dynasty. In the legend told, the Goddess Taleju came to the King’s rooms in night time as a beautiful woman and they played Tripasa (a dice game) together. The goddess visited the King every night; however, the King wasn’t allowed to tell anyone about their meetings. Unfortunately, in one fateful night, the King’s wife followed him to his chamber and saw his secret meeting with the Goddess Taleju. As the Goddess became aware of the presence of the King’s wife, the Goddess left furiously. After that, the Goddess Taleju told the King in his dream that she would come back, but she would reincarnate in female children in Shakya and Bajracharya community of Ratnawali. Jaya Prakash Malla started searching for female children who were possessed by the Goddess’s spirit. Therefore, the tradition of the living Goddess started. Kumari Ghar, a house for Kumari, was built following the King’s order. The second story is about King Trailokya. As the story told, the Goddess Taleju came and played Tripasa with the King, as well as discussed with him about the welfare of the country. One night, Trailokya blasphemed the Goddess as he made sexual advances towards her, which infuriated her. After that, Trailokya did worship and plead for the Goddess’s return. The Goddess Taleju agreed, but she would appear in the body of a virgin female child from the Shakya family. Therefore, the Kumari cult began. Besides, the horoscope of the nominated girl must match that of the King. However, that is just the past. Nowadays, maybe the President of Nepal’s horoscope is put into consideration. Besides, the girl must show her courage by undergoing an extraordinary rigorous test on the night of Kalratri. She must watch the butchering of 108 sacrificed buffaloes and goats with a masked man dancing on top of the blood without showing any signs of fear, and after that, she must spend the whole night alone in a place with dead animals around. If the girl still stays completely calm, she will be taken into the Taleju temple and installed as a new incarnation of the Goddess. As the Kumari is considered as the perfect symbol of beauty in Nepal, especially in the Newari community, she always has to dress beautifully and brilliantly, especially in the festivals and formal occasions. 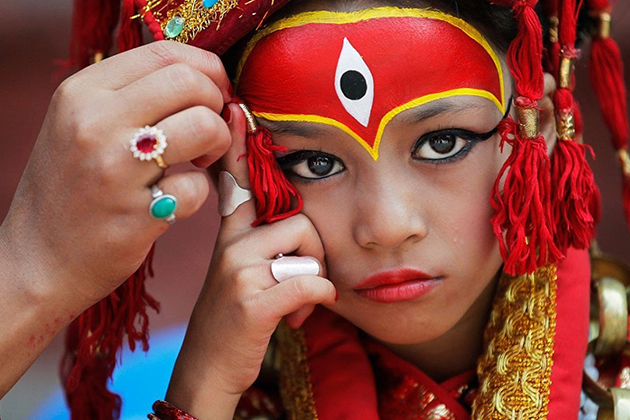 A Kumari always has to be dressed in red, since red is the color of Gods and power according to Hindus’s belief in Nepal. The living Goddess often wears a red Jama (cloak), a red bhoto (shirt) with a red pagari (turban). Besides, she also has to wear ornaments, not only around her neck but also around her hand and feet. Her hair has to be gathered on a topknot and decorated with flowers. 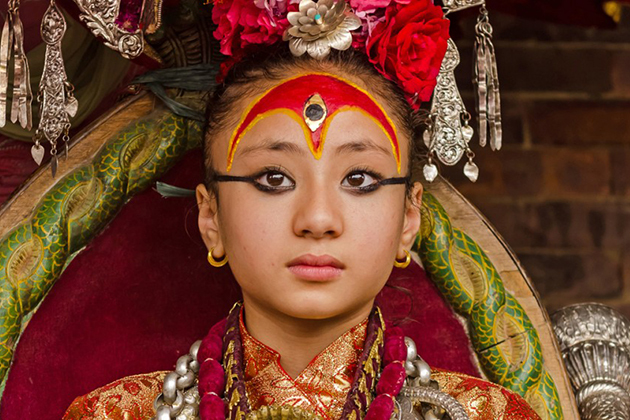 The most important thing is a third eye (tri-Netra), a metaphorical eye, which is painted on her forehead. This eye is believed to have the power to destroy all the evil in the world. We can see easily that a Kumari has to wear garlands of gold coins and diamonds, as well as two necklaces having special symbolic meaning. One necklace is a golden chain in shape of the serpent god called “Basuki Naga”. This ornament has several symbolic meanings. Firstly, it is considered as the symbol of the national treasury’s guardian. The Kumari Goddess is also the Goddess of wealth, Laxmi, in Tihar festival. Secondly, the serpent is usually considered as the symbol of anger. Thirdly, the most important season among all the seasons of farmers is closely related to the serpent god, because, during this time, snakes often bite farmers. As a result, people worship god Naga in Kumari Puja in order to protect their wealth from the anger of the serpent god Naga. Another ornament of the Kumari is a long golden tayo. The Kumari often wears it on her neck to show her authority with the eight mother goddesses. Another ornament is a red tika placed on the Kumari’s forehead. It is the symbol of the cosmic earth’s energy. This bright and glowing tika is a sign of property, health and a bright future of the nation. A girl’s life changes completely after being chosen as a living goddess. Once she is selected, the time she walks in the Durbar Square will be the last time she walks, since her feet are considered to be sacred, and people will kiss her feet to seek for blessing, and she will be carried almost all the time. A Kumari can’t leave her palace, which is called Kumari Ghar. The Kumari Gar is always a favorite spot for tourists when visiting Nepal. Every day, enthusiastic and curious foreigners and devotees flocking into the yard of Kumari House. Being a living goddess, a Kumari has to live isolatedly from the outside life. Her parents have to quit their job in order to become the Kumari’s full-time carers. All of her desires and demands are important, and people who are in her service have to make sure that all of those demands are met. Traditionally, a Kumari is not educated. However, nowadays there is a kind of private tutor who will take care of her learning. A glimpse of a Kumari is believed to bring good fortune. Every day, a lot of people visit the courtyard in front of Kumari’s window with the hope of getting a glance from the living goddess. Many of those visitors are suffering from illness and menstrual disorders. During any visit, every action of the goddess is watched closely since all of her actions will be interpreted as a prediction of life. The former Kumari, Living Virgin Goddess, retires upon puberty, normally in 15-year old. After retiring, it is quite hard for the former Kumaris to walk property because they had been carried all the time and the outside life would be strange to them. Education is something strange to the Kumaris as they are confined to their houses or temples. However, in 2008, Nepal’s Supreme Court overruled a petition against this custom and demanded reforms, stressing education in those who are Kumaris. Also, in the past, Kumaris were not supposed to marry; but now some ex-Kumaris are married.